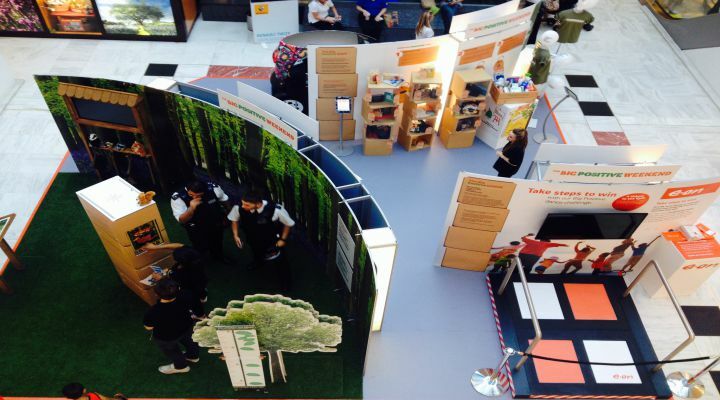 Hammerson's first national sustainability roadshow kicked off at West-Quay Shopping Centre. Our first major consumer-facing sustainability event, the target for Big Positive Weekend is to achieve 200,000 pledges for positive actions over the course of nine weekends. Nationwide's woodland campaign was a big attraction with over 700 pledges being achieved on the first day, each of which Nationwide will turn into a tree. Paint a Positive Future, the local schools art competition, generated tremendous interest with a high turnout already in the voting for the winning piece. The chance to win a sleep over under the sea or a day in the life of a marine biologist and release a rescued seal pup with the Sea Life Centre Conservation Trust clearly captured a lot of interest. Voting continues online for a week. The West Quay After Dark Takeover film was a major attraction too. Street Basketball super-star Tom Connors' tricks and skills wowed a big audience and reached thousands on Instagram. You can see the film on the link below. The film was created through Somewhere To____ an inspirational organisation giving young people access to space to practice their skills and showcase their talents. There were plenty of takers for the chance to generate electricity by dancing on the Eon dance floor, and people were surprised by how much energy it takes to generate a small amount of electricity. This is a big message for our audience - it takes a lot of energy to produce enough energy to power the things we take for granted so we need to use it wisely. The electric cars from Renault received lots of attention. The incredibly cute Twizy brought a smile from everyone as people queued to see it and the all electric Renault Zoe was getting lots of admiring attention - particularly when people found out it costs about 60p for a full charge! The chance to win £500 of positive products from Gucci perfumes to Timberland shoes was very popular. By completing a short survey about how we can all be more sustainable consumers people came away more informed and in a great prize draw. As a platform for raising awareness of sustainability and showing that it is something everyone has a role to in the roadshow so far has been a big success. More news as it comes and and on our twitter feeds and hashtags #BigPW.